Seemingly out of nowhere, the National Weather Service has identified the possibility of significant snow for the Twin Cities early next week. While most forecasters had previously thought a little light snow was possible, this appears to be a significant change in their thinking. Let the speculation begin. Should Star Tribune column be updated? Here we go again,Novak says we need to alter our travel plans,where have we heard this before. Has he said yet,"I love the set-up for........."(fill in the blank)! Hey, easy on the personal attacks on Novak. He provides a lot of good analysis for this blog. He's not always right but nobody is. So does this mean that our "focus on storms and we'll get nothing, ignore them and we'll get something" idea is working? Is PD wrong or on the right track, as of now, he seems out alone on a limb, saying that we aren't going to seem much in the way of accumulation here in MSP. I've noticed his blog has become the all or nothing spectrum. Not surprised at the change as NW flow very difficult at times for timing and exact path of snow. Sat vapor imagery right now as I stare at a 24 hour loop over the wrn US shows the situ and why models are reacting as such EXCEPT the operational GFS. It is a well south of the rest. It will be interesting to see where the sfc and mid-level lows track on Monday. The same system will be diving SE toward Georgia/Carolinas with threat of snow -- we shall see. Extremely disappointed with the GEM solutions over the last 24 hours. To go from 16" of snow to 0 in one model run is totally uncalled for and irresponsible. I thought the GEM had it figured out with the latest model upgrade that took place a few weeks back, but I guess not. Whenever a model suffers Schizophrenia, I tend to lose confidence in it. I'm bummed because I really started to trust GEM. Why Gem, WHY? You know what is irresponsible,I'll tell you what is irresponsible.It is irresponsible to put out forecasts and change forecasts DRASTICALLY because of one suite of model runs,with this potential incoming system there has been too much emphasis given to models people "love",everyone gives crap to the GFS but it has handled this storm well,Paul Douglas has it figured,learn from him!I've watched the NWS go from 50% of snow,to just 20%,then snow LIKELY,to now 30% in the last 36-48 hours,just because it favors one model over another,just this morning they said the GFS was an outliner,we'll disregard it and sounded the alarm you all read this morning and now read it they are putting more emphasis on the GFS.We were over 60 hours from any flakes from POSSIBLY falling and I had to hear stuff like "alter my travel plans"(Novak) and "get ready to shovel"(Hammer) this morning,and don't tell me these were meant has a heads up,red flag kind of thing,they didn't use the words "possible","could","potential","it may" in front of their statements did they?IRRESPONSIBLE! All this meteorologists here or pseudo-ones or presumed expert: where is your experience to provide consistency when there is not one in the models? I've been a little surprised at the bullish forecasts from a number of meteorologists about this storm. The euro has been the most consistent with this storm keeping the heaviest snows roughly from Devils Lake, ND through Marshall, MN. 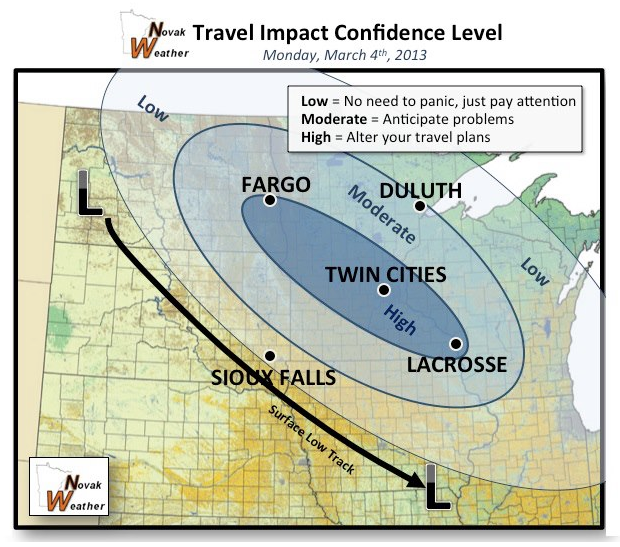 I think the Twin Cities could get brushed but I wouldn't expect much. As far as the GEM goes, I'd rate that model #4 behind the ECMWF, NAM, and GFS. Over previous winters I never trusted this model. The only time I did buy into it two storms ago, because I thought it aligned better with what was going on in the atmosphere. I was burned, I learned my lesson. The American models have been all over with this storm, and have not shown any consistency. When in doubt, trust the ECMWF. What I find interesting is the mixed presentation of the Strib weather page this morning. 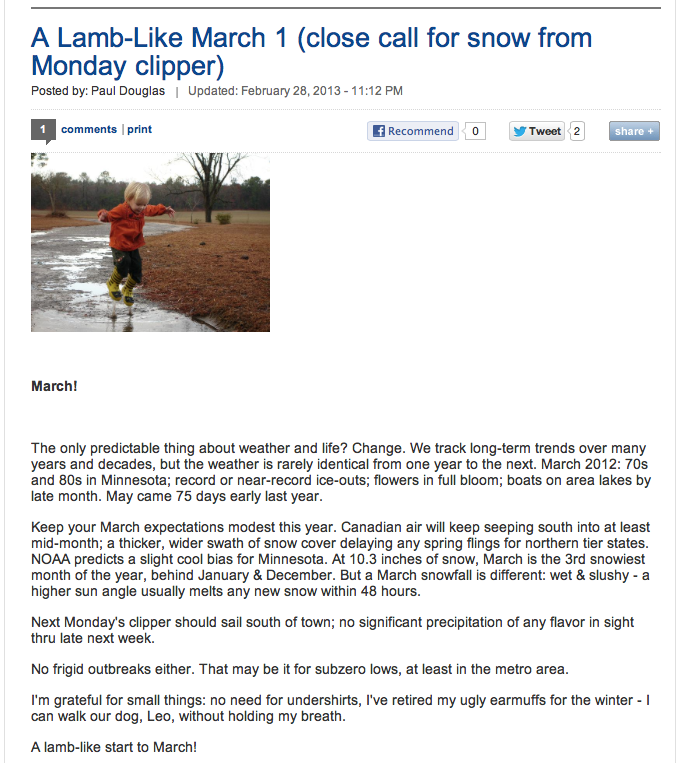 The accompanying weather video segment talked about a significant snow on Monday yet the Paul Douglas blog (updated last night) did not (the screen capture depicted in this post came from that). I think the Strib really confuses their readers sometimes, but that's another issue. I guess some posters on this page are assuming that Hammer & myself are changing our tune. I don't believe that is the case. I don't want to speak for Hammer, but I'm still more than confident that this storm will bring much of so. MN significant snow. My whole point with my last post is that you can't hang your hat on each model run because what model solutions like the GEM's over the last 24 hours. I believe Randy states it best when he says "when in doubt, trust the Euro". Some of the latest model runs from the GEM & GFS have thrown some doubt into the snow scenario, but the 12z Euro paints a NW to SE swath of significant snow near or just west of the MSP metro. This solution could be totally hosed, I'm going with it. I guess we will have to wait until we see the "whites of its eyes". Quite frankly, I don't know what 'Anonymous' & 'Weather Junkie' expect from weather forecasters. If you are going to take on the challenge of wx forecasting, you can't be afraid to go out on a limb and be wrong. If you don't, then weather would be boring as hell. I don't want that because I enjoy Meteorology & Climatology. I think someone on here recently said something to the effect of waiting for 36 hours or so before the storm is supposed to hit. A couple of other people ripped that poster for that comment. Well, I happen to agree with that comment! Talk to me a day or two before the storm if you want to discuss what will likely occur. Usually, any further out is just conjecture, such as the current situation where the percentages are bouncing from 20% to 50% to 60% to 20%. Good grief! I haven't heard one mention of rain/mixed precip until I read the KSTP/Johnathan Yuhas blog tonight,were sitting here and talking about will it snow,will it not snow and boom!,he drops the snow mixed with freezing rain forecast,really?I told you PWL we should have kept it hush-hush,my head is spinning with up and down %'s,altered travel plans,untrusted GEM and the lovable Euro and now we throw rain into the mix! Scattered rain showers mixed with snow with possible thunder,really?......did he work for accuweather before moving to Minnesota? Well, you know what my prediction is. It is out there for everyone to see. I'm not wavering back and forth nor do I believe in doing so. As far as anonymous is concerned, you are living in a fantasy world my friend. The truth is that people want an idea of what is going to happen well in advance. They have plans. They have the weekend to think of. They have Monday AM commute to consider. If you believe that a weather forecast is only good for 36 hours at best, then you are listening to the wrong forecasters. Perhaps you are a forecaster yourself who is scorned? Weather forecasts need to improve and I will do whatever it takes to lead that charge. We know it is an imperfect science right now, but it doesn't hurt to take on the challenge and change the status quo that is killing our industry right now. Walk out on a limb for God's sake. Hey Novak, I hear you there. I don't know, but possibly what anonymous might have been trying to say is that the accuracy of forecasts 36 hours or less is much higher than beyond 36 hours, so if you want accuracy then focus on the shorter time period? I don't think anyone is advocating for there to be no forecasts made several days in advance. I know I'm sure not advocating that. Anyway, that is my two cents on how I interpreted that comment. Regardless, happy forecasting! Not sure anyone will read this on an old thread, but I'm all for no long range forecasts. They are worthless. As someone who has to work outside in the elements, I am so sick of seeing a seven day forecast predicting NOTHING for precip and then all of a sudden we get a "significant" chance for snow. Most recently, I heard a "quiet two weeks coming" and then wham!! Big storm on the way. And then we have to listen to them talk about it for a week while it makes its way across the rest of the country. Good lord, do they ever stop talking about these "snow storms"? Nothing pisses me off more than getting my hopes up for a quiet period and then getting slammed by the "monster storm coming". If you can't see it a week ahead than don't tell me nothing's coming. As for the Strib confusing the reader, I see that all outlets are confusing the reader/viewer/listener. I firmly believe when it comes to forecasting the "storms", they purposefully predict EVERYTHING will happen. Then at least they can say they forecasted what actually happened and some will only remember hearing one thing and that will be the actual result. In other words, there will always be some people fooled into thinking they had the forecast correct. Too many media outlets get into a bidding war and try to one-up the others resulting in this hype-a-thon. We would be better served by one weather forecasting service with an official forecast and having the media only allowed to use that forecast instead of all the extra options muddying the waters of expectations and results. At least then there wouldn't be so much confusion over whether they "got it right" or not. There would actually be some accountability. Hi everyone. I am new to Minnesota. Can anybody explain why Lakeville often has colder temperatures than most any other area of the Twin Cities? Is Lakeville a higher or lower elevation than the surrounding area, etc.? Thanks! WTC on their web broadcast say "some snow this week. we will keep an eye on that" HA! I love it. @Anon. Some "Heat Island effect"
is a partial reason for lower temps that Mpls proper. Lots of asphalt/concrete/ holding heat. It's been a while since someone has mentioned the model trends. Am I reading the 12z GFS correctly....did it make a shift to the north on us? Thanks guys......the operation hush-hush is working......just read NWS afternoon discussion. TWC 8 hours later now says "Maybe as much as 6" for Monday/Tues with rain. According to TWC (getting less silent), sounds like it could be a wet one ? looking at forecast soundings from bufkit for both the GFS and NAM I just can't believe rain is entering into the forecast, someone needs to get their eyes checked. And the 03/0z Nam has come into better alignment with the other models as far as QPF goes. I want to comment on the discussion that took place earlier about responsible vs irresponsible forecasting. My personal opinion is that if 5 days out a forecaster see's a major storm with a 100 miles of home he/she should start to use language like this. " A major winter storm could impact the region, please stayed tuned if you have travel plans, the track of this storm is unpredictable, but be aware, as you may have to change your plans." To keep information tucked under the label of suit jacket is irresponsible if you ask me. I work in the high end retail industry, I heard a few of our guest's mention that we were under a winter storm watch as they got the info off their smart phones, that system seems to be working, but it was about 2 days to late IMO. The longer lead time the public has as to the possibilities the better off we will all be. Novak's map at the top of this thread looks to be about right. @ Big Daddy.....I will have my snowfall forecast out by early afternoon on Sunday March 3rd. As usual with a big snowfall event(since I have the day off) I will split the metro up into four quadrants. The east west axis will be I394 and then I94 to the WI border. The north south axis will be I 35. This is really getting interesting. Thanks Randy........I'm getting excited because your getting interested! MNPLOWCO...you are going to have busy week, especially with our commercial accounts. Winter Storm Saturn is on the way or as Paul Douglas names it on his blog the "turbo-charged clipper". "Let the predictions begin! On the positive side of all the comments -- "Saturn" is going to only help the serious drought situation in central and southern Minnesota. Something I will reiterate is that NW flow systems are a bugger to forecast by the models thus not surprised at some jockeying by the GFS or really wildly, the Canadian GEM. The ECWMF has been fairly consistent as has, believe it or not, the US NAM. Either way a nice swath of snow across central and southern Minnesota. But, also keep eye as this storm heads ESE impacting Chicago who desperately needs more snow. Then the system moves into Ohio Valley and becomes very significant across the Eastern Seaboard from N Georgia to the Megalopolis. The storm was named due to the expected impact for so many large cities/population centers in its life. Enjoy the snow up there in Minny! A bit concerning if your wanting the heaviest snow in and around the metro,it was to be to the west of us,now it has shifted to on us,the concern is this shift will continue and the heaviest snow will fall in Wisconsin,that is why the NWS has not gone with a winter storm warning as of yet and flakes are suppose to fly in about 12-18 hours,don't get me wrong everyone will see snow,but it could just be an advisory event. Was just watching TWC and their discussion of Saturn and put an graphic on the screen showing Minneapolis in the 8-12 range with 12-18 not too far behind to our northwest,that's a big change from their 2-4 from yesterday! Ian Leonard tweeted 3-6" for the watch area. Lots of uncertainty with this. Therefore I'm issuing an official forecast of 3 to 15 inches for the Twin Cities. LOL...that should cover all bases! Ian had a subsequent tweet which mentioned 5-10, with 3-6 just being the first part. NWS 6 AM Aviation Statement today. KMSP...NOT ANTICIPATING ANY PROBLEMS TODAY WITH CEILINGS AOA 060. CONDITIONS DEVELOPING AFTER 04/06Z AND CERTAINLY LIKELY AFTER 04/12Z. 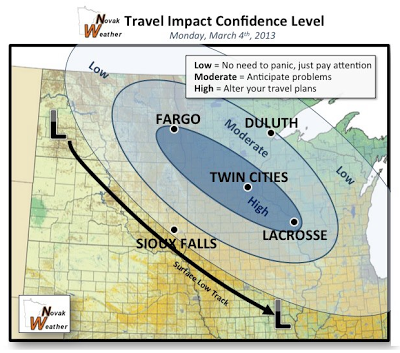 LOCALLY HEAVY SNOW IS PROJECTED TO MOVE ACROSS THE TWIN CITIES. Interesting how the totals continue to increase. Interested in final predictions from Novak, Randy, and Hammer. MORNING. SNOW WILL SLOWLY DIMINISH TUESDAY AFTERNOON. ISOLATED AMOUNTS NEAR 12 INCHES POSSIBLE BY TUESDAY AFTERNOON. WILL RESULT IN SOME BLOWING AND DRIFTING SNOW IN OPEN AREAS. Just got a notification that we've been upgraded to a winter storm warning for the metro. They're predicting 6-12"! NWS La Crosse just upgraded to a warning for their Minnesota counties. Is anyone peeing their pants yet? Sweet! LaCrosse has us in the 9-13 inch range! Quietly might be the biggest storm of the year. Happens at least once a winter.......less hyped storms turn out to be bigger ones!this is exactly what the doctor ordered to sell the last of my winter inventory......keep bringing it and keep peeing! Funny one @DysonGuy,it was a nice chuckle,but seriously I sell snow clearing products(snowblowers,shovels,ice melt, and such)if I don't sell it I sit on it all spring and summer. Can anyone explain why a clipper would drop so much snow? Seems very out of the ordinary. This Clipper is slower than a normal clipper- MUCH slower. In addition to having more time to dump on us, this clipper now has the time to gather moisture from the gulf, giving it even more energy. Normanlly a clipper would come and go so fast that it would not have time to tap into the gulf or dump more than a few inches. That is what is different about this clipper. Its not really a clipper. A clipper is really a short wave trough coming from the northwest. A short wave is just a jolt of energy in the atmosphere. This is going to be a fully developed and mature atmospheric trough that just happens to be coming from the northwest. 40s and rain in a week! Shut up! your the same never over 10 inches Anonymous aren't you!,there will even be another dumping after this one sorry to tell you,it may hit 40 but this won't be the last snow. My forecast and full description of what I think is happening and what will hopefully happen is up on my blog. Right now I expect 6-10" across the metro, with 8-9" at MSP. This storm will definitely be an interesting one to watch. @Randy Hill Thanks for the specific MSP forecast. Will include that with next post about to be issued. MARCH 21-23 STORM FROM 2008. Its nice but I was really looking forward to the bike trails clearing up sometime this month. Oh well.